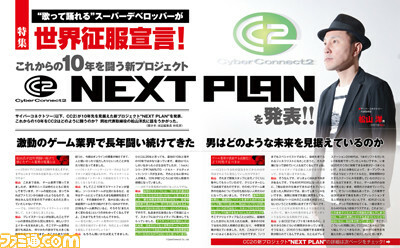 The latest issue of Weekly Famitsu has a feature on CyberConnect2 that reveals three new titles part of a new “Trilogy of Vengeance,” as well as its strategy for the next 10 years. A dramatic strategy RPG and adventure story of dog-people and cat-people boys and girls. It inherits the world setting of Little Tail Bronx depicted in Tail Concerto and Solatorobo. It will also have shooting action and roguelike elements. The protagonists are 11 children whose parents were kidnapped by the Berman Empire. They pilot a huge tank called Taranis that they find along the way to save the adults, and throw themselves into violent battles. A high-speed action game that depicts the lonesome battle of a girl named Towako Mutsu in Tokyo, a Japanese city where ghosts and magic are ordinary. The story begins after World War I, with the opening of the “Ogre Gates” connecting hell to this world due to Genshu Kubizuka’s plan to overthrow the Japanese government. You will gradually accelerate as you slash enemies. The faster you go, the higher your attack power will be. Tokyo Ogre Gate is not just a horizontal side-scroller, the stages also change to behind the back-scrolling and in front of the character-scrolling. A 2.5D horizontal side-scroller and stylish action game where a bloodstained battle between four sisters unfolds. Summoned by their mother, the four sisters are made to participate in a ceremony to become a witch, but the cost of that ceremony is the loss of each of their most precious things. Players will fight with an umbrella and pole sword. Aristel – The eldest sister. She loses her beloved husband, and as a sinner was stolen of her body’s freedom and made to wear a restraining device. Rezalia – The second daughter. She loses both of her legs. Carla – The third daughter. She is stolen of her voluptuous body and growth, and appears like a child. Cecile – The fourth daughter. She lost her voice. She is also the protagonist. The four sisters have a bad relationship, and and will kill their own flesh and blood in order to steal each other’s hearts. Until now we have been making contracted games. Since there are currently ongoing projects, these productions will continue as they were. Apart from this line, we have launched our own publishing project to deliver titles of small scale and short-term development that can only be made by CyberConnect2. Currently, the big project contracted titles are three lines, and with our self-published titles, a new three lines are starting. In total, we are promoting development on a six line system. Since our approximately 200 staff are currently working full-time on our contracted lines, we plan to increase our numbers to roughly 300 people in the next two years. We launched a project called “C5,” or “Cyber Connect Creative Challenge Competition,” in relation to our self-published titles. We had a new title plan competition that targeted all of our staff, and selected the top 10 titles that drew our attention. From that selection, three were carefully chosen and turned into projects. Development on Project Venom is currently at a halt. The plan was originally to create a MOBA-style game, and that was not of small scale or short-term development. Another reason is that the person that led that project is working as the director of another big title. I am thinking about re-examining it after completing the titles we are currently involved with. Thanks, Famitsu, Ryokutya2089 (2), and Hachima Kikou. Update 7:40 a.m.: New information added.